Description: An easily grown, hardy species related to B. integrifolia. 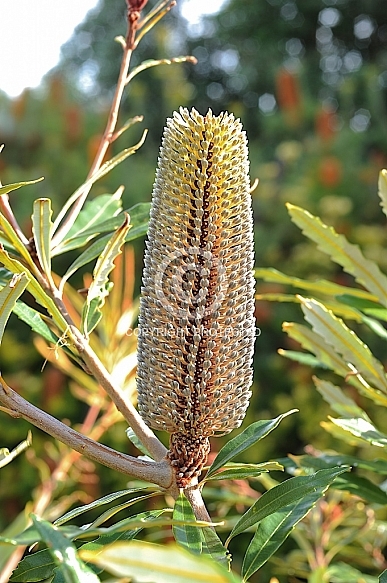 It freely produces attractive, cylindrical flower spikes up to 15 cm long. These are pale yellow which are often tinged with blue-mauve, particularly when immature. The main flowering time is from autumn through winter. It is sometimes used in floriculture. B. oblongifiolia usually forms an erect, bushy shrub of 2.5 m under cultivation. It has a prominent lignotuber which facilitates hard pruning when required.